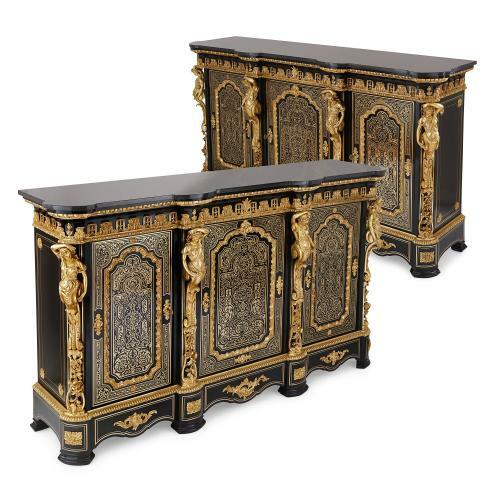 This fine pair of cabinets are made of ebonised wood, and are decorated to an exceptional standard with fine Boulle marquetry brass inlays and ormolu mounts. 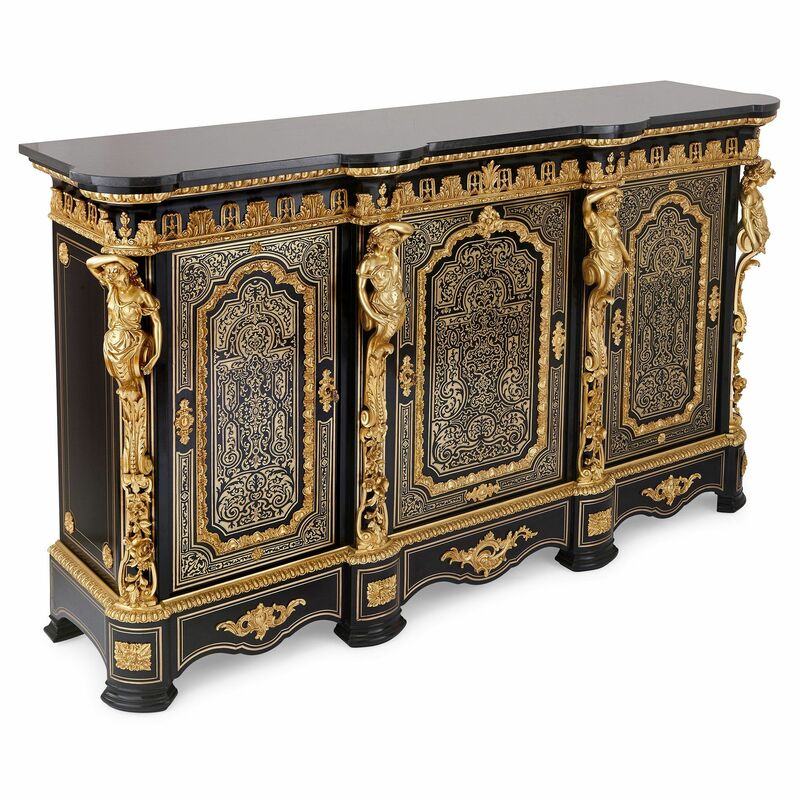 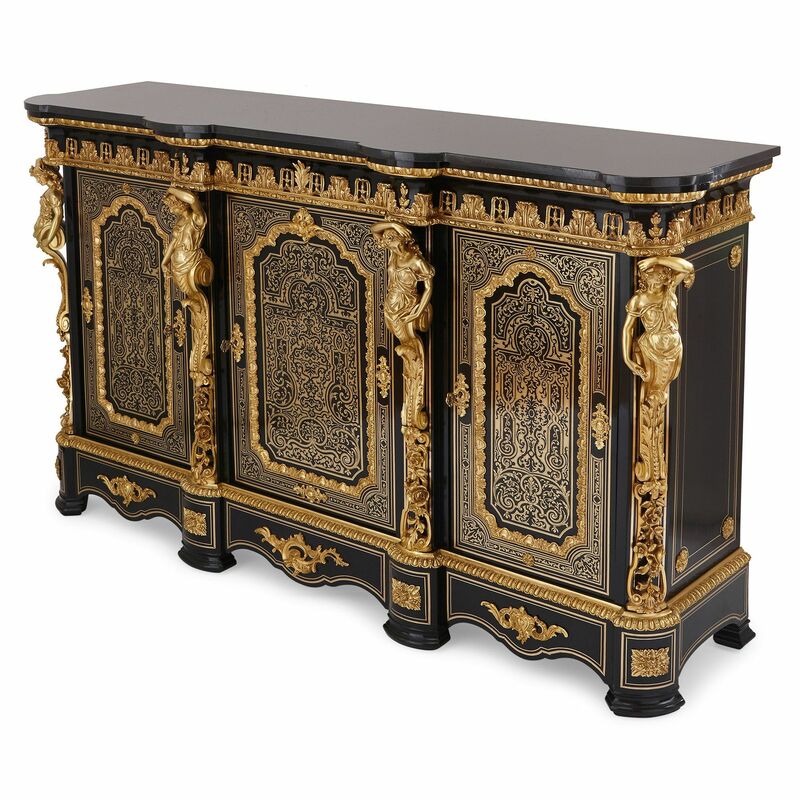 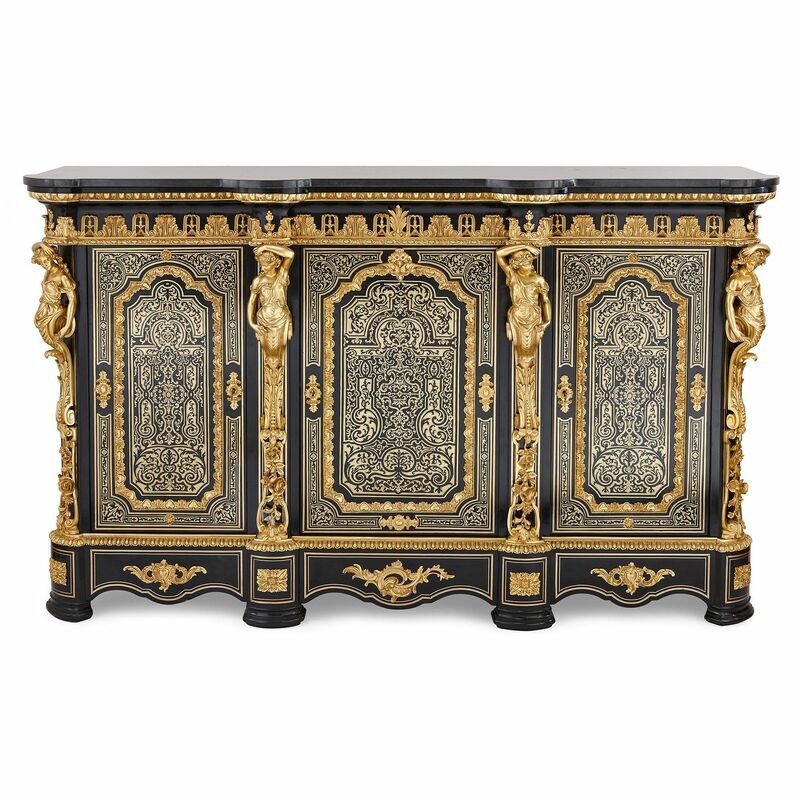 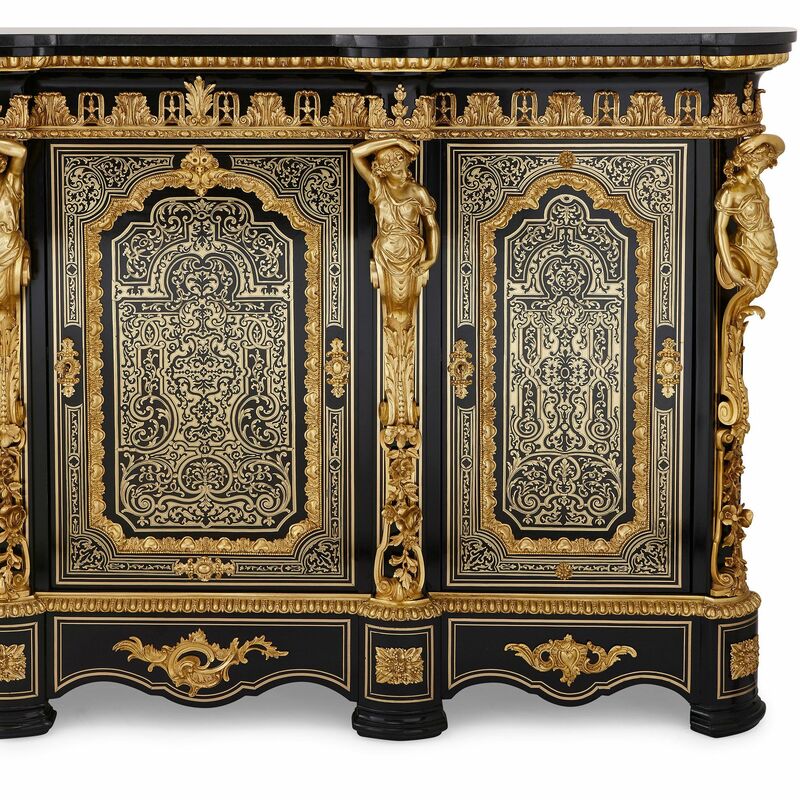 Each cabinet features a solid black marble top, above an egg and dart ormolu frieze, which runs above an ormolu frieze of stylized acanthus leaves. 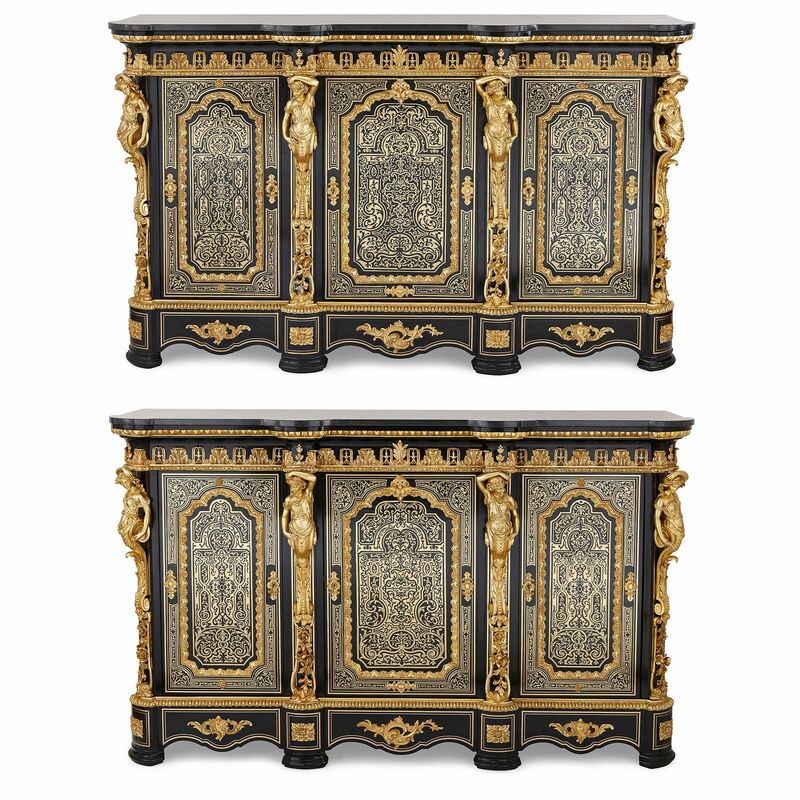 The front of each cabinet is divided into three hinged compartments, of which the central compartment is slightly larger than the flanking pair. 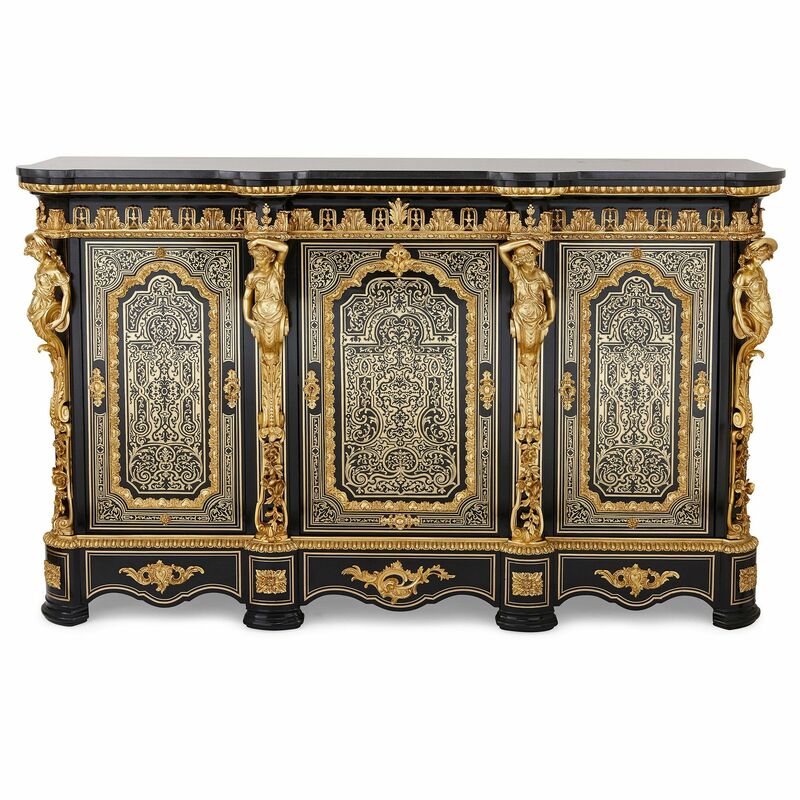 The compartment doors are very finely decorated with a panel of Boulle marquetry, with scrolling arabesque designs, incorporating a frame-shaped ormolu mount within the design. 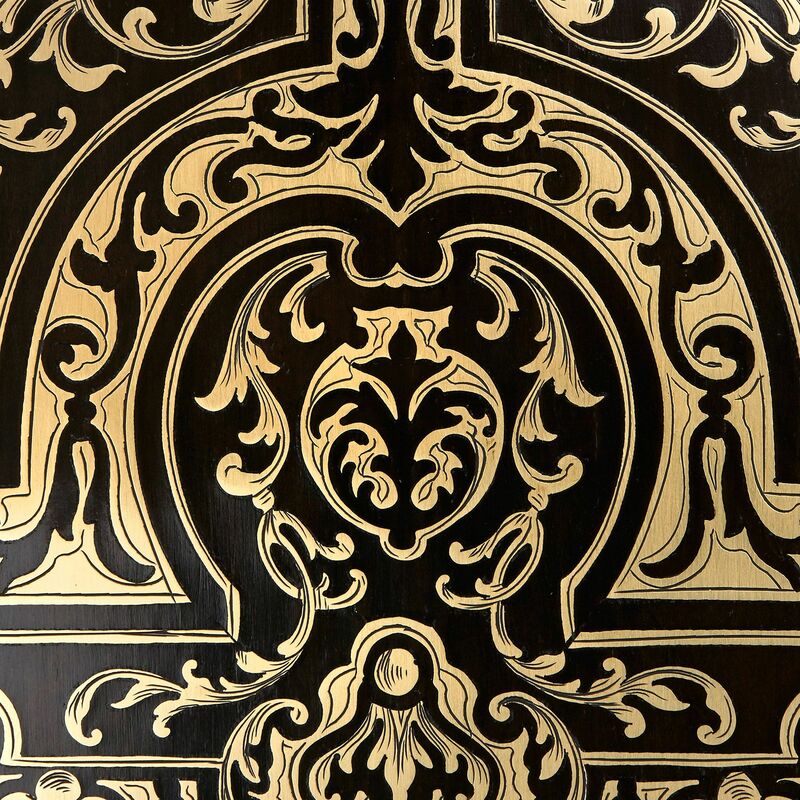 Each ormolu frame is flanked on either side by two ormolu mounts of stylized acanthus leaf form, one of which can be used to open the door with an ornate ormolu key. 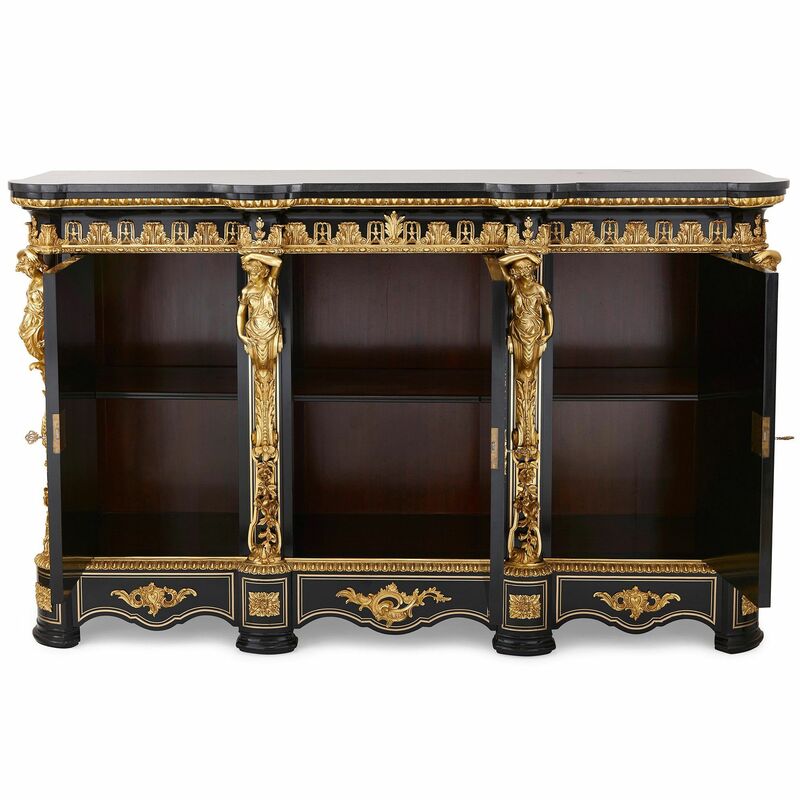 The cupboards are intersected vertically with four ormolu mounts of caryatids, flowers and acanthus leaves. 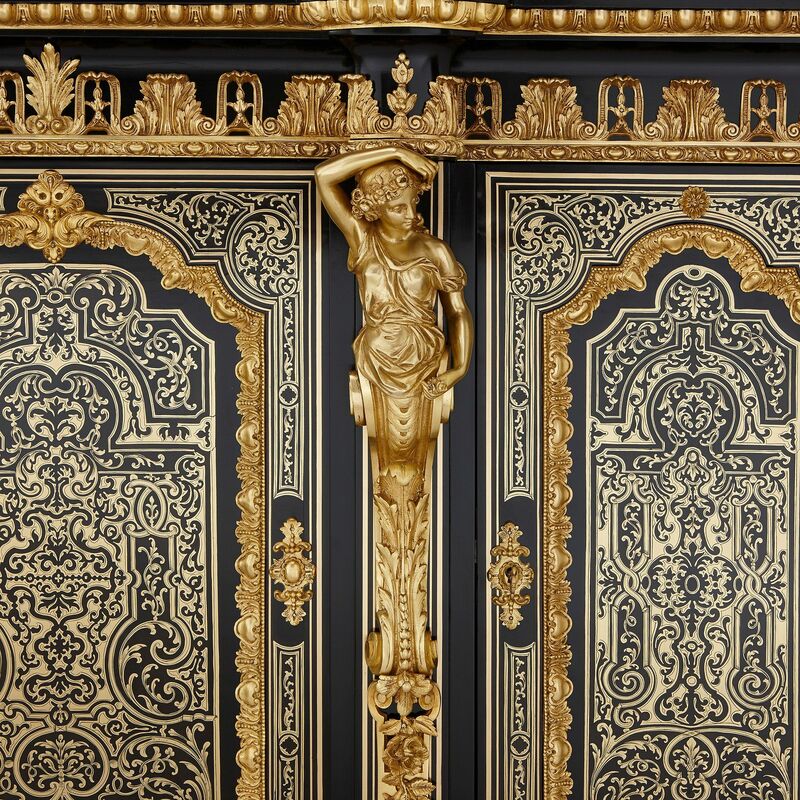 Another frieze of egg and dart ormolu runs around the lower section of each cabinet, above the base of the cabinet, which is formed of sections bordered with an ormolu frame and each centered with an ormolu mount of acanthus leaves or flowers; all set upon ebonised wood feet. 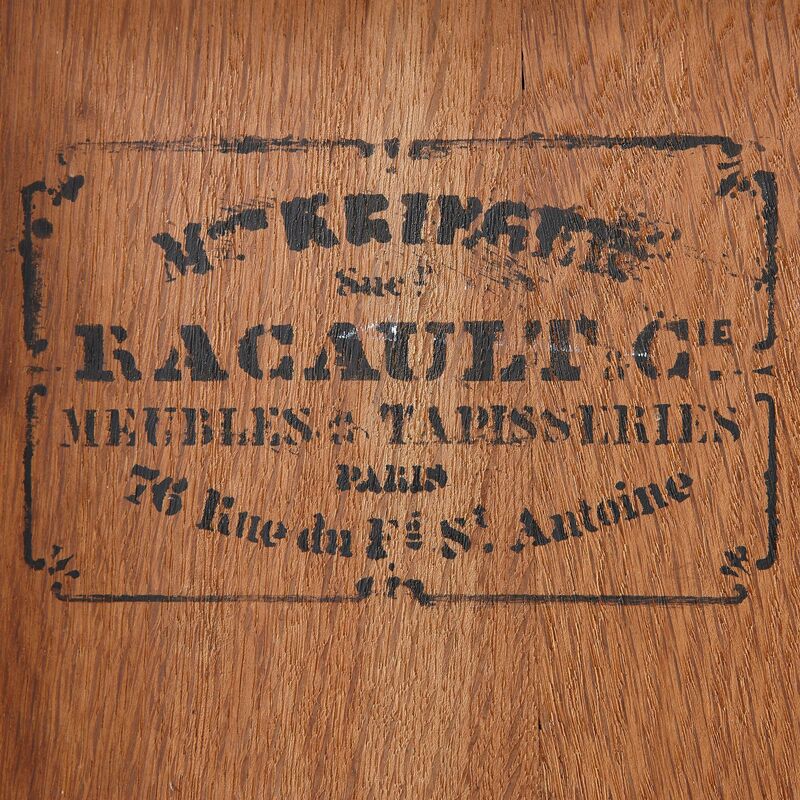 Each cabinet is stamped 'M Krieger / Racault & Cie. / Meubles & Tapisseries / Paris / 76 Rue du F St. Antoine' to the reverse, for Maison Krieger.